They say dog is man’s best friend, yet there are about seven million cat owners in the UK alone. When you talk to a cat owner, they generally seem to know their cats very well. Some might tell you their cat will run away when new people enter the room while some will tell you their cat will immediately come over and rub up against you. 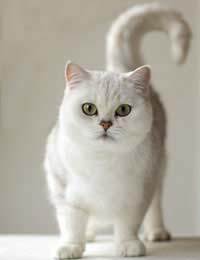 Each cat has its own distinctive personality, but did you know that cats in general have their own body language? Learning the body language of your cat can help you understand it better. If you are a cat owner, you probably want to make life as enjoyable as possible for your cat. But, since they can’t verbally tell us they are happy, how do we know? Happy cats often have sleepy, half open eyes. They may also yawn and stretch in front of you. Only a happy, content cat who feels safe will do that in your presence. If they are stretching towards you, it is a good sign he or she is happy as well. If you have more than one cat and they like each other, you may see them rub cheeks. This is a friendly form of body language between cats that get along with each other well. Happy cats will usually lay on their chest, although they may roll on their back too. Be careful because a cat on its back may also signify that it is ready to use its claws for defence. However, you will see many happy cats who playfully use their claws to swat at toys while on their back. Even indoor cats will have times when they feel threatened. Flattened ears that almost lay straight back are a good sign of a cat that feels, in some way, scared. In addition to the ears lying flat, the cat’s whiskers may get flat up against his or her head as well. A tail tucked between the legs also is a tell-tale sign that a cat is scared. You can also look at the cat’s eyes for a clue. Frightened cats will have wider pupils. This cat may try to make himself or herself as small as possible by going into a crouched position. A cat that is scared is often feeling threatened, so the cat’s body language may be the same. The ears may still be flattened and the pupils may be wide. However, a threatened cat may have his or her tail in a horseshoe shape rather than tucked between its legs. Threatened cats may spit as well. The cat’s fur may also stand on end. This may be to give the appearance of being larger than the cat actually is. Sometime after frightened or threatened, a cat may begin to get angry. Probably the best known body language of a threatened cat is the arched back, which will include the fur on end. The ears are still back, but may not be lying flat like they were when the cat felt scared or threatened. The once wide pupils have now become slits. If the cat is angry at another cat, they may stare intently at each other. The cat’s head may be lowered and the whiskers are now pushed forward. A thrashing tail can also show anger in a cat. Understanding the body language of a cat can help you know if your actions or the environment is making him or her happy, scared, threatened, or angry.